We have available to you the most suitable holiday accommodation on the Canary und Balearic Islands. Our offers exclusively comprise of accommodation at a reasonable price-performance ratio. We also know many of the holiday accommodations personally which you can see by our seal “checked personally”. As a specialist in the Spanish holiday islands, we are also very happy to advise you by phone if you're still not sure which holiday destination is the best for you. We can help you to spend the perfect Canarian vacation or a sunny Balearic holiday because you will find Canarian cottages as well as Balearic holiday homes. Tenerife is with its approximately 2034 square kilometers and almost one million inhabitants the largest of the Canary Islands and at the same time the most diverse. In the north you'll find green vegetation with occasional cloudliness; the southern vegetation is rather a semi-desert with maximum guaranteed sun. The mountains, which are also home to the highest mountain in Spain with the 3,718 meter high Pico del Teide, serve as a meteorological divide and play a decisive role in the various climatic zones of the island. The main tourist areas are situated in the north, the municipality of Puerto de la Cruz and in the south with the huge holiday resorts like Playa las Americas and Los Cristianos. Especially in the south, there are also plenty of quiet tourist places, very close to the main cities, such as Playa San Juan, Callao Salvaje and Playa Paraíso. Gran Canaria is with its 1560 square kilometres the third largest Canary Island after Tenerife and Fuerteventura. Similar to Tenerife, the mountains serve as a meteorological divide between the north, which is frequently covered and planted with laurel forest, and the semi-desert-like south. The largest tourist area is located in the sunny south of the island with places like Maspalomas and Playa del Inglés. Also l ocated in the north is the island's capital Las Palmas with the Playa de las Canteras, a beautiful beach for holidaymakers. Lanzarote is about 845 square kilometres and has about 145,000 inhabitants. In 1993, the entire island became an UNESCO Biosphere Reserve. The volcanic origin of the Canaries is most visible on Lanzarote. This is demonstrated figuratively in the Timanfaya National Park, where Geysers are artificially brought to "let off steam", or where you can grill your steaks on hot lava. Lanzarote has always maintained a more quiet level of tourism, which is mainly due to the Canary artist Cesar Manrique. Only thanks to his influence there is only one high-rise building on the island, which is located in the capital Arrecife. Popular tourist areas are Puerto del Carmen and Playa Blanca. Nearby are the Playas Papagayos which are possibly the most beautiful beaches of the Canary Islands. 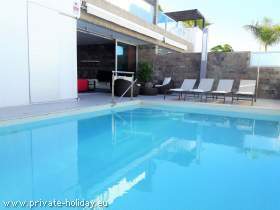 Fuerteventura Fuerteventura is the second largest island of the Canaries and has approximately 1659 square kilometres. Fuerteventura has only about 100,000 inhabitants, what clearly embodies the sparse population. That is why there are many possibilities for individual travelers to go on excursions to deserted landscapes. Due to the fact that the island has no high mountains, the climate is on the whole island of Fuerteventura practically equal. Tourist areas are in the north of the town of Corralejo with its famous, long sandy dunes and in the south with the peninsula Jandia with Costa Calma and Morro Jable. On Fuerteventura you can spend an ideal Canarian holiday, provided that you love white and wide-stretching beaches. La Gomera's size is approximately 369 square kilometres with about 23,000 inhabitants. Despite the fact that La Gomera is quite small, it has several climate zones. The island's north is lush and green, whereas the vegetation round the southern regions decreases, because there is significantly less rainfall. The Garajonay National Park with its laurel forests is located in the island's center. The laurel forests are a relic from the days before the last ice age, because the Canaries were untroubled by the ice age due to it's location. That's the reason why the forests are still like they have been in the Stone Age and the way our ancestors have seen them. La Gomera has no mass tourism. Popular with holidaymakers is the Valle Gran Rey, which is attune to tourism and provides an appropriate infrastructure with cafes, bars and restaurants, but only in a small scale and in a pleasant, rustic atmosphere. The island is especially for peace-seeking vacationers, hikers and nature lovers paradise. El Hierro is the smallest Canary Island with 268 square kilometres and with barely 10,000 people living on the island permanently. Despite the small size of El Hierro there are different climate zones. Caused by the mountains, the north is humid and the south drier which leads to higher temperatures. The island has no airport and this is why there's practically no tourism. However, exactly that's the reason why El Hierro is interesting for individual tourists, because you can spend a vacation on the Canaries away from any tourism and off the beaten tracks. Majorca is well-known for mass tourism and drinking excesses. However, Majorca has a lot more to offer and completely different facets which can hardly be discovered with a package holiday. 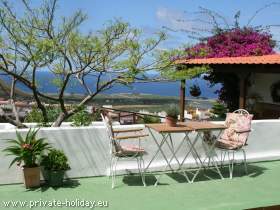 Especially for peace-seeking vacationers it is indispensable to rent a private finca or a holiday house. 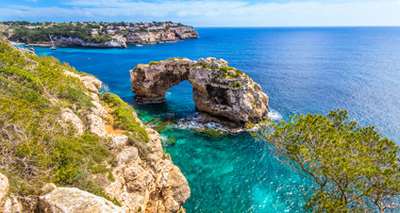 Flights to Majorca are easy and inexpensive to obtain, thanks to competing low-cost airlines. Majorca has around 3,603 square kilometres and is with just 900,000 inhabitants sparsely populated, which offers a lot to discover. A holiday on the Balearic Island is also possible without mass tourism. Ibiza has approximately 571 square kilometres and about 130,000 inhabitants. Ibiza is known as the party capital of the Balearic Islands. Here the international jet set meets and therefore Ibiza is deemed to be the island of the rich and the famous. The season is like in Mallorca the summer half-year, because the climate of the Balearic Islands in winter is in comparison to the Canaries much cooler. Tourist centers are in the region around the capital city "Ibiza Town" and also increasingly the region around San Antonio.